On Oceania's Insignia, size matters. It's large enough to be easily recognized as a cruise ship, but onboard the environment is intimate -- and quiet. 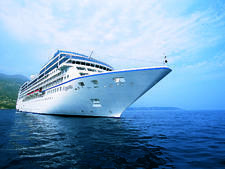 The size, a few hundred passengers smaller than fleetmates Marina and Riviera, is what attracts people to Insignia, and the elegant yet contemporary atmosphere keeps company with a mature crowd looking to travel unique itineraries in comfort. Cruise ships are often described as floating hotels, and an extensive 2018 refurb brought Insignia from manor house decor into a more contemporary look. Three impressive chandeliers were added in public spaces, continuing the ship's elegant feel. Baroque framed paintings and red-and-gold color schemes were updated with a sea blue, green and taupe color palate that's modern without being clinical; Insignia still feels cozy and comfortable. The update also extended to cabins, which now have more contemporary fixtures, such as padded headboards and glass shower doors (although the size of the bathroom remains small). Service onboard Insignia infuses the human element of luxury -- it's a constant flurry of greetings, many times with your surname intact, ma'ams, sirs and "right away." Passengers who look for good service will find it attentive and exceedingly professional. We never had to ask for much and when we did, we didn't have to wait long for our request to be fulfilled. If you ask for a single piece of toast to be well done, that is precisely what you will get. 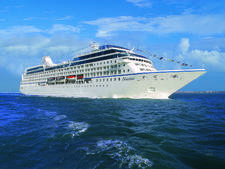 We were surprised to find a large number of first-time cruisers or new-to-Oceania passengers onboard. We met many retirees who were curious about the product or cajoled by friends and found their way to Insignia; they commented positively on the food, service and the relaxed pace -- always in that order. Solo cruisers are also accommodated with meet-ups, table matching at meals and activities led by a woman whose job onboard was listed as "social hostess." 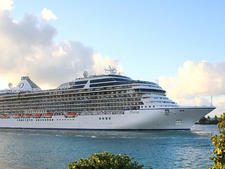 While the hefty single supplement is still in place, we heard from a few passengers that they would happily pay it not to have to sit alone or be one among thousands on the larger cruise ships also targeted at an older demographic. There's no fear of missing out on something aboard Insignia. That's because there's never so much happening that attending a lecture or a game of shuffleboard would create a strain in a tight schedule. For many, that's a relief -- especially given the overwhelming list of things to do onboard many mega-ships. You can lie in the sun and sleep soundly at night knowing you only skipped the golf putting. You'll be hard-pressed to find a crowded place onboard (except, perhaps, the buffet at peak mealtimes) -- and that can be both good and bad. Food is a main event, and Insignia's culinary offerings are a true highlight of the sailing. Oceania invests in its food and wine, relying on upscale ingredients and visionary plating, and the line regularly wins accolades for its dining. The new chandelier in the main dining room makes the space sparkle, literally, and Versace plates lend an aura of high-end restaurant gravitas to your meals. Overall, the essentials -- your room, the food, the surroundings, the crew -- are top-notch on Insignia, and a vacation with plenty of ports will distract from some of the gaps in programming. The ship has a lot of fans and the fresh look, outstanding dining and interesting itineraries will likely bring more into the fold. Retired couples, friend groups and adult children traveling with elderly parents are largely what you'll find onboard Insignia sailings; it would be very rare to spot a child or even a young adult. The passenger mix on Insignia is predominantly English-speaking -- about 85 to 90 percent American (depending on the itinerary), followed by Canadians and some Brits. 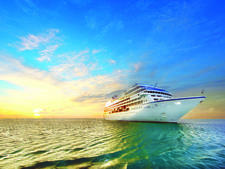 A wider variation of cultures can be found on world cruises, and a slightly younger crowd sails the Caribbean itineraries. There isn't much of a dress code on Insignia, but the guidelines they have in place are enforced. Country club casual is the term used for daywear, which is much the same as you would find at a resort -- your usual shorts, polo tops, sun dresses and so forth. There are no formal nights onboard an Insignia cruise, but elegant casual is encouraged for the evenings. That means button-downs and slacks for men; skirts, dresses and dressy pants outfits for women; and no jeans, athletic shoes or sandals, casual T-shirts or hats. The evening dress code is enforced in both specialty restaurants and the main dining room; passengers opting for a less dressy evening can visit the Terrace restaurant for dinner. Tank tops and swimwear are never accepted at any of the main venues, including tea time. Both specialty restaurants onboard Insignia are free of charge, and at least one reservation in each, per cruise, is guaranteed for each passenger. 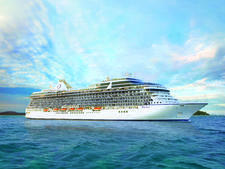 All passengers onboard Insignia can expect plenty of bottled water -- in staterooms and before heading out on excursions -- as well as coffee and espresso drinks from the Baristas coffee bar, and nonalcoholic drinks including soda, smoothies and frozen drinks. Each cabin has a mini-fridge that is stocked with a variety of seltzer and soda, free of charge. A free shuttle into the town center is included in most ports, however shore excursions are additional. All fitness classes are complimentary onboard Insignia, with the exception of personal training. Concierge-level passengers and above can enjoy the use of the Canyon Ranch Spa Terrace any time of day, free of charge. Anyone in these rooms also receives a complimentary Oceania Cruises tote. All bar and spa bills carry an additional 18 percent auto gratuity. Daily gratuities are automatically charged to a passenger's onboard account, but can be adjusted or removed as seen necessary. Insignia passengers in standard staterooms are charged $16 per person, per day for tips that are dispersed between room attendants and restaurant staff. Suite passengers are charged $23 in gratuities per person, per day. The currency onboard Insignia is the U.S. dollar.